I make no secret about the fact that I love technology. As well as being an adrenaline junkie, I am a self-confessed geek! I work with Technology & have had a strong interest from a very young age. At about 8 years old I used all my persuasion skills to convince my Dad that we needed a home computer. Nights of nagging and pestering him, insisting that we would be left behind if we didn’t buy a PC like all my friends had. Finally I was victorious! A 256MB Carerra PC with Windows 95…. £2500 bought the absolute latest – cutting edge – top of the range machine. The feeling was tremendous; I still remember coming home from school and taking turns with my sister to play solitaire! Needless to say, my negotiation skills were probably founded on persuading my Dad to upgrade computer after computer over the years, ensuring that we were given the best possible chance in life (oh how dramatic I made it sound) and that we were never left out. When I think back at these days, I can’t help but smile. We grew up in an era where computing was born and the way in which the world works changed forever. I look forward to the day I get to explain to my kids that I didn’t always have a computer and a mobile phone.. I largely grew up and learned without wikipedia and google and I know how to use the contents and index page of a real book! As computing advances, the gap between mobile phones / tablets / laptops / PCs closes further; the choice of which platform to choose depends more on what size of screen you want, rather than the processing power or memory requirements. My iPhone 5 has a camera capable of taking better pictures than most digital cameras could a few years ago and a better graphics chip than some recent dedicated handheld games consoles. I can access my emails, video chat via skype and connect to all my social networks in an instant. The paradigm shift is happening! The point I guess that I am trying to make, is that mobile phones are increasingly becoming an essential companion in our everyday lives. Airlines are issuing tickets through mobile apps, energy companies allow you to take meter readings, road tolls can be paid using NFC technology… the list goes on. As mobile phones become more featured-packed, the cost of what’s inside continues to increase. An Apple iPhone will cost you upwards of £500 in the UK to buy outright and mobile phone companies need to recuperate these costs throughout the duration of a contract. As the price of the handset increases, the length of the contract follows suit. Up until recently in the UK, 12 month contracts were the norm; whereas now you will be lucky to find any 12 month deal that includes a phone. 24 and more recently 36 month arrangements are becoming the standard. I write this post as I am about to come to the end of my 18 month contract. On January 28th, I am no liberated from my contract and am free to change tariff / upgrade my phone. I am currently subscribed to a 18 month tariff which includes 600 minutes, 1750Mb of data and unlimited text messages. I didn’t pay any additional costs for the handset (iPhone 4S) and have a monthly charge of around £50. I am lucky that one of my best friends works for the network and I benefit from family and friends discount – 30% off my total bill. In effect, I have paid £35 a month for 18 months for this phone. This works out at a total cost of £630 over the duration of the contract and when you subtract the £500-odd value of the phone, it is clear that I have a very good deal. Do I upgrade to the iPhone 5 or do I transfer to a sim-only tariff with no fixed contract? Will the iPhone 5S / iPhone 6 be worth waiting for? Should I look at other handsets other than iPhones? There are plenty of Samsung phone deals about..
Do I sell my iPhone now or wait?… Will the value drop dramatically when the next iPhone is released? If I wait, what happens if my friend changes job and is not there to reapply the discount on my new tariff? If I upgrade now will a new iteration get released next month? Clearly lots of questions to be answered…. A Deal is Only a Deal if You Want the Thing in the First Place! Perhaps the answer is that I don’t actually need a new phone after all? My current iPhone does everything that I want it to and I am not restricted from any future software upgrades for now. Sure, I could be saving a bigger chunk of money against a new contract… but do I really need a new phone right now? Maybe I am just looking for a deal for the sake of a deal…..
What would you Do? How much do you pay? Is the latest handset important to you? I’d probably just keep the old phone. I’m currently using a 3 year old blackberry and probably wouldn’t upgrade except for the fact I need to get e-mail from work on my phone and to download the software for blackberry will cost me money (it’s a free app with the iphone). I thought I might get one for x-mas from the bf, but since he didn’t buy it I might break down to buy it for myself. Phones don’t really mean much to me though. The bf on the other hand loves to have the latest technology. I guess it’s all what you prefer, since the phone you have now works fine. Woops!!! I always apply the FFP system – is what I have “Fit for Purpose” – so until my new phone I had a Nokia 3310 which was FFP for such a long time. When it began to fail I looked around at what I wanted to be able to do with it (my parameters had changed) and actually found a deal that cost me no more but for a higher spec phone. I could drive a low-slung red sports car – but the ancient Vauxhall Astra was FFP. So by working out what is FFP I avoid spending on the “nice but not neccessayr” which will get me to my dream so much quicker. I love this way of thinking Elaine. I apply this to 90% of my purchases, but the things that I am truly interested in and enjoy – I splash out a bit. Thing is, I can’t work out if the phone fits into this category anymore, or if it has now become an everyday item!! 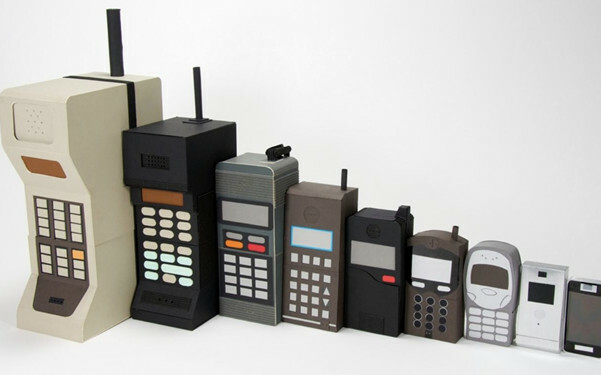 I love the pictures of the old cell phones. It’s hard to believe they were ever that huge! I remember my first one. It was a big as a home phone and came in a giant case! They really are quite crazy huh!? When I was searching for pictures to use, there were actually some that were mounted on horse’s saddles (I assume from the WAR days)! You are a Samsung man then huh?! I have been tempted to try their phones (given that their TVs are amazing and they will probably take over the world one day) – Apple have just sucked me in with all the nice synchronising features with my Macbook!! Tough call! It’s also difficult to predict when Apple launches a new product. Personally, I don’t see enough improvement in the iPhone 5 to warrant an upgrade. I’m perfectly happy with Apple and the iPhone, but would much rather wait to see what the next generation brings. I reckon it’s coming in the next few months (the 5S) but totally agree that there isn’t enough of an upgrade to justify upgrading…. Maybe I will wait for the iPhone 6. Part of me wants to try something non-Apple, but maybe I am just getting bored for no reason. It’s blows my mind how far we’ve come in such a short time. In college I had to go to the “computer lab” and wait in line to use a “word processor” and to log in we had to use DOS commands. Then we used a shared printer…the kind where we had to tear off the edges. OH, and as a college freshman I lived in a dorm with one phone line for four girls with no call waiting or any kind of answering machine. I’m only 42! It was like the dark ages! I personally don’t have to have the latest gadget. I kind of wait until the trend levels off and just about everyone has that thingy and so to keep up with the times I get one. Or usually what happens is I end up dropping my phone or something and that means having to get a new one. Haha I remember the computer labs at school…. what a contrast to iPads at every desk huh!? And the tear off edges on those large connected sheets of paper… HAHAHA!!! The next generation are going to find some of this stuff very hard to believe huh!? Dropping your phone accidentally on purpose ;)! The devil inside? 3 year contracts are the norm here in Canada and we all hate them. Usually by the time my contract is up, my phone is losing functionality or having lots of issues. This time I was really lucky to get a BB torch from a friend and that’s what I have been using for awhile. I will probably have it for several more years, without a contract. BB10? no ways man! 😛 Blackberry are unlikely to survive the next few years 😉 ! 3 year contracts are definitely too much for me.. would you not be better off buying the phone outright and getting a sim only contract? No. “Pay as you go” prices are usually much, much higher, especially for smartphones. The whole structure of the industry works a lot differently here, compared to most places. Usually the phones are $6-800 if you buy them outright, but $0 – $100 if you get a contract. If you buy it outright, the cost of the service isn’t any less, either, so it’s very, very rare for it to make sense to buy the phone. I would sell the old one while it still has value, buy the Iphone 5 on ebay and get a PAYG SIM. Since you value technology, and with wifi everywhere you won’t lose a lot of comfort. I personnally have a dumb phone and PAYG, as I lose them or they get stolen and I don’t really care about my phone other to call people. A 2 year plan on such rapidly changing technology is a big bet. Pauline recently posted..13 money resolutions for 2013: #13 enjoy! That is a very good potential idea. I like the idea of having a dumbphone again… maybe I would switch off a bit and learn to relax?! I agree with you that 2 years is a long time considering the advancements – looks like the Canadians have it worse with 36 months! My old one is so knackered, it requires charging twice a day now, and I’m lucky if the alarm goes off to get me up in the morning. I’ve decided to try and “future proof” myself to an extent, so I have plumbed for a free LG Nexus 4 google android phone on the best value contract I could find. It will get all the latest upgrades as and when they are released, (my old galaxy S is still on a very laggy previous android version, it’s sloooow), and it has twice the RAM of most other phones, so it should stay fast for much longer. I got my contract with O2 through an aggregator site, so it’s much cheaper than going direct and it includes free BT wifi, so even if I can;t get a signal (quite common where I live), I can always use some of the local wifi hotspots instead, win win! Haha not a good sign if the alarm is dodgy! What deal did you get on O2? That is awesome that it can latch onto BT Hotspots… I assume it uses the BT FON spots too? I got O2 internet 100 all rounder for £21.50/mth with free phone, which is 100 mins, unltd texts, 500Mb data and free Wi-Fi via O2 & BT Openzone, and yes apparently you can use BT Fon as well. I could have got it £1/mth cheaper with Orange, but their customer service is terrible, and so’s their signal round here! I’d definitely recommend using an aggregator site rather than going direct, as even the carphonewarehouse, who I’m currantly with, couldn;t get anywhere near that deal, wanting at least £26/mth off me, and I’m an existing customer. They did say that you could always take your phone into the shop if you had problems, but that’s just it. I have had problems, and they were useless, so next time, if it all goes badly wrong, I’m just going to claim for a new phone through insurance instead. Am currently deciding whether to insure it separately, or rely on my house insurance. I have an iPhone 4 purchased outright and use a rolling one month contract. The phone does all that I need and I don’t feel the urge to upgrade yet. I was with O2, but switched to Giffgaff which uses the O2 network. What has impressed me about them is they sent me an email analysing my phone usage and advised me to change from my rolling £10 monthly contract ( 250 minutes unlimited text, 1GB data) to one costing £5 per month! I am in the process of switching my wife to the same deal and we shall have a combined bill of about £10 per month ! That is incredible that they suggested a downgrade of tariff – that is true customer service! 🙂 I went for a 12 month sim-only deal. With my friends discount, I ended up on a £17.50 pm deal for unlimited texts and calls and 2Gb data !! Winner!